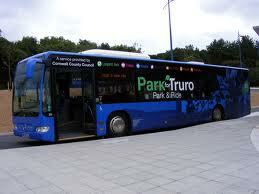 Today is the third birthday of Truro’s Park and Ride. In the last three years it has carried more than 1.3 million passengers and has (so Cornwall Council say) taken roughly 1000 cars daily off the roads. It is also claimed that the 1700 daily passengers are 99% satisfied with the service. Putting the statistics aside, I personally think this service is great. If you need to go to hospital the bus drops you right outside the hospital, and all for £1.20. In fact, if you don’t like paying for the car parking charges you can use this service and park all day, for £1.20. A bargain in anyone’s book. As someone who travels into Truro on almost daily bases the traffic would be far worse without the park and ride. Plans are afoot for another park and ride on the eastern side of Truro, but this is slightly controversial because the scheme comes with a lot of houses and another supermarket. So well done to Cornwall County Council and now, Cornwall Council, for providing this service. The proposal for the Eastern side also includes facilities for a recyling centre which would be an obvious benefical addition. However, as for the proposals for housing including 'Affordable' how about building houses to rent, as a certain percentage of so called affordable housing is still not affordable for young people. Particularly given the uncertainty of the current job market. Do like good news stories! You mentioned the east Truro idea – do you happen to know if this will be the model for use at St Erth as well? My last comment should have read (no I do NOT live in rented and no I do not claim state benefits and I am glad I do not live in Wadebridge) Very often when the council is criticised there is a reference to council tax payers or council tax money. It should be remembered that councillors are council tax payers as well, so it is their money too. As individuals, they are not always in control as to what it is spent on. Don't shoot the messenger, as they say. Yes, the Park and Ride is subsidised to the tune of £300,000 per year. This amount is getting reduced year on year as more people use the service. Got to keep fares as low as possible to encourage people to use it. Once people are, there will be no need for any subsidy. Please tell us the total subsidy received by the park and ride(so far) and the capital costs?,dont think in the real world a business gets congratulated for needing a substantial subsidy every year,but then most cllrs have never run a proftable business have they? Happily find that info out. On a side note, our taxes subsidise concessionary fares to the tune of £7m. I am 25 years off a pass, but I don't mind paying for it. With complete respect, how would that work then, you paying for a pass. At the moment I believe they are free (correct me if I am wrong. If you paid for one then there would be no pass, you may just as well buy tickets, if you see what I mean. Sorry, perhaps it is just my logic. I have just realised, that you probably meant that you do not mind paying for the current bus pass scheme in the tax you pay. So now you have it confirmed, that I am officially thick.